There is a lot of confusion when discussing the proper sub-floor for a hardwood flooring installation. A lot of the confusion is due to basic construction terminology, while some confusion is created by inexperienced sales staff at many of the big box retailers. 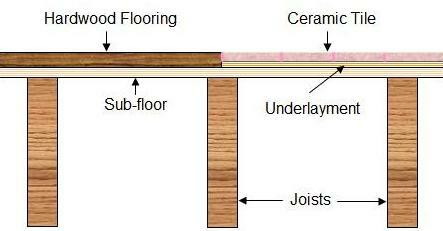 A sub-floor is that material which is directly nailed to the floor joists in a house or other building, as shown in Figure 1. Basic construction calls for the joists to transmit the house load to the foundation and on those joists is nailed a layer of material that forms the sub-floor. The studs for the walls, both interior and exterior rest on the sub-floor. It is called a sub-floor because a finish material is always placed on top of it. The sub-floor is actually a structural component of the house serving to mechanically tie the floor joists together. Particle Board, 4&apos; × 8&apos; sheets, of various thicknesses. Note: In warmer climates where a basement or crawlspace is not provided the sub-floor may be poured concrete. Underlayment is not a sub-floor. Underlayment is a material that is affixed to the sub-floor by means of nails, screws and/or adhesive as shown in Figure 2. One of the primary purposes of the underlayment is to provide a smoother surface for the finished flooring. Underlayment is very common when installing vinyl flooring. Underlayment is also used to raise a section of floor so that two different finished flooring materials end up level with one another. Figure 3 is an example of 3/4″ hardwood flooring in one area meeting 1/2″ ceramic tile in another area of the home. A piece of 1/4″ underlayment is used under the ceramic tile flooring in order to make the finished height of the ceramic tile flooring and the hardwood flooring the same. Underlayment can also be used as method of stiffening the sub-floor and thereby eliminating bounce which can crack grout in ceramic tile installations. One of the primary differences between an underlayment and a sub-floor is that an underlayment can be removed whereas a sub-floor should only be removed by a qualified contractor who understands the structural make-up of the home. Hardwood flooring should always be nailed or stapled to the sub-floor. Because of this, the ability of the sub-floor material to hold a nail or staple without releasing it is the critical criteria for choosing the best sub-floor material when installing hardwood flooring. The following list provides sub-floor materials suitable for hardwood flooring from the most desirable to the least desirable. Note: Floor joist installation is considered to be at 16″ centers or less. Douglas Fir, solid #2 or better or frame grad pine 1″ X 6″ boards, installed diagonally over the floor joists. Plywood 5/8″ Tongue & Groove. If you have an older home you may have other materials and sub-floor systems in use. These sub-floors need to have a 1/2″ CDX plywood underlayment attached to the current sub-floor before the installation of the hardwood flooring. The use of staples and adhesives is the recommended method of attaching the plywood underlayment to the sub-floor.